A view inside the Alcator C-Mod tokamak. New research from MIT shows two types of turbulence within plasma that cause significant heat loss. Solving this problem could take the world a step closer to fusion power which has the promise of limitless and relatively clean energy. One of the biggest obstacles to making fusion power practical — and realizing its promise of virtually limitless and relatively clean energy — has been that computer models have been unable to predict how the hot, electrically charged gas inside a fusion reactor behaves under the intense heat and pressure required to make atoms stick together. The key to making fusion work — that is, getting atoms of a heavy form of hydrogen called deuterium to stick together to form helium, releasing a huge amount of energy in the process — is to maintain a sufficiently high temperature and pressure to enable the atoms overcome their resistance to each other. But various kinds of turbulence can stir up this hot soup of particles and dissipate some of the intense heat, and a major problem has been to understand and predict exactly how this turbulence works, and thus how to overcome it. 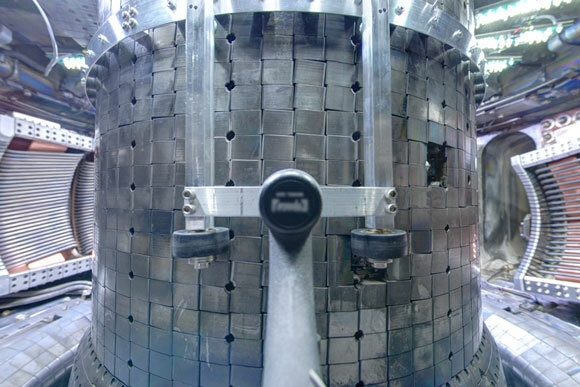 A long-standing discrepancy between predictions and observed results in test reactors has been called “the great unsolved problem” in understanding the turbulence that leads to a loss of heat in fusion reactors. Solving this discrepancy is critical for predicting the performance of new fusion reactors such as the huge international collaborative project called ITER, under construction in France. Now, researchers at MIT’s Plasma Science and Fusion Center, in collaboration with others at the University of California at San Diego, General Atomics, and the Princeton Plasma Physics Laboratory, say that they have found the key. In a result so surprising that the researchers themselves found it hard to believe their own results at first, it turns out that interactions between turbulence at the tiniest scale, that of electrons, and turbulence at a scale 60 times larger, that of ions, can account for the mysterious mismatch between theory and experimental results. The new findings are detailed in a pair of papers published in the journals Nuclear Fusion and AIP Physics of Plasmas, by MIT research scientist Nathan Howard, doctoral student Juan Ruiz Ruiz, Cecil and Ida Green Associate Professor in Engineering Anne White, and 12 collaborators. “I’m extremely surprised” by the new results, White says. She adds that it took a thorough examination of the detailed results of computer simulations, along with matching experimental observations, to show that the counterintuitive result was real. The expectation by physicists for more than a decade had been that turbulence associated with ions (atoms with an electric charge) was so much larger than turbulence caused by electrons — nearly two orders of magnitude smaller — that the latter would be completely smeared out by the much larger eddies. And even if the smaller eddies survived the larger-scale disruptions, the conventional thinking went, these electron-scale whirls would be so much smaller that their effects would be negligible. The new findings show that this conventional wisdom was wrong on both counts. The two scales of turbulence do indeed coexist, the researchers found, and they interact with each other so strongly that it’s impossible to understand their effects without including both kinds in any simulations. However, it requires prodigious amounts of computer time to run simulations that encompass such widely disparate scales, explains Howard, who is the lead author on the paper detailing these simulations. Accomplishing each simulation required 15 million hours of computation, carried out by 17,000 processors over a period of 37 days at the National Energy Research Scientific Computing Center — making this team the biggest user of that facility for the year. Using an ordinary MacBook Pro to run the full set of six simulations that the team carried out, Howard estimates, would have taken 3,000 years. But the results were clear, and startling. Far from being eliminated by the larger-scale turbulence, the tiny eddies produced by electrons continue to be clearly visible in the results, stretched out into long ribbons that wind around the donut-shaped vacuum chamber that characterizes a tokamak fusion reactor. Despite the temperature of 100 million degrees Celsius inside the plasma, these ribbon-like eddies persist for long enough to influence how heat gets dissipated from the swirling mass — a determining factor in how much fusion can actually take place inside the reactor. Previously, scientists had thought that simply simulating turbulence separately at the two different size scales and adding the results together would give a close enough approximation, but they kept finding discrepancies between those predictions and the actual results seen in test reactors. The new multiscale simulation, Howard says, matches the real results much more accurately. Now, researchers at General Atomics are taking these new results and using them to develop a simplified, streamlined simulation that could be run on an ordinary laptop computer, Howard says. In addition to the theoretical simulations, MIT graduate student Ruiz Ruiz, lead author of the second paper, has analyzed a series of experiments at the Princeton Plasma Physics Laboratory, which provided direct evidence of electron-scale turbulence that supports the new simulations. The results offer clear, independent evidence that the electron-scale turbulence really does play an important role, and they show that this is a general phenomenon, not one specific to a particular reactor design. That’s because Howard’s simulations were based on MIT’s Alcator C-Mod tokamak reactor, whereas Ruiz Ruiz’s results were from a different type of reactor called the National Spherical Torus Experiment, which has a significantly different configuration. Understanding the details of these different mechanisms of turbulence has been “an outstanding challenge” in the field of fusion research, White says, and these new findings could greatly improve the understanding of what’s really going on inside the 10 tokamak research reactors that exist around the world, as well as in future experimental reactors under construction or planning. The research was supported by the U.S. Department of Energy. 1 Comment on "New Research May Solve Longstanding Fusion Reactor Mystery"
What needs looked at is creating a laminar flow within the plasma so that the circular (or other types of flow can be used, for example stretched torroidial/cylindrical looping flows. The magnetically induced in-plasma flows can then stabilize the whole plasma (thermally and spatially) such that heat loss is minimized as there is a more uniformity of ‘surface heat’ on the plasma. Currents within the plasma flow will tend to even out and increase the inherent stability and controllability of the plasma. The equation for the optimial flow rates of “dense plasmas” need worked on such that there will be a point of optimun laminarity is reached. These fast moving inducted flow plasmas or “cochran plasmas” will start to generate stable thermal output. The plasma fusion heat output can be regulated by inducing turbulence as needed by speeding or slowing the flow.